The AIRAID 100-253 fits some Chevrolet Camaro, and Pontiac Firebird models. See vehicle applications for details. The AIRAID F-Body Air Intake System allows you to build a custom air intake system in order to produce more horsepower and acceleration from your engine by replacing the factory air filter assembly with a low-restriction, high air flow induction system. This air intake system fits 1967-1969 GM F-Body vehicles and is intended to be used with AIRAID UBI air intake 3 inch tube set 100-300. Your vehicle’s restrictive factory paper filter and air box are removed in order to mount a new AIRAID premium air filter in the original air box location. The AIRAID premium air filter is washable and reusable, less restrictive than traditional paper, and assures superior filtration. The AIRAID F-Body Air Intake System is compatible with AIRAID UBI Master Kits and is easy to install with common hand tools. 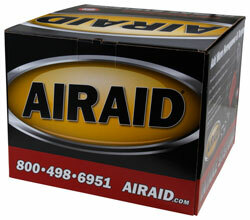 The air intake system is backed by AIRAID’s exclusive No Hassle Lifetime Warranty. Some AIRAID air intakes are not legal for sale or use in California and other states adopting California emission standards, while others are 50 state legal. View the product's vehicle applications to determine the legal status for each vehicle.